Financial Statements are prepared to give the client a scorecard to help understand the position and activity of the business. Financial Statements may be used for 1) to help manage the business, 2) to provide to shareholders to help them understand their investment, 3) to provide to potential investors, 4) to provide to lenders when obtaining a loan. The basic financial statement are: 1) Balance Sheet, 2) Income Statement, and 3) Statement of Cash Flows. In addition to the basic financial statements notes to the financial statements are provided. The notes provide additional explanations to financial statements that just numbers can’t provide. Financial statements are prepared on a basis of accounting such as GAAP (Generally Accepted Accounting Principles), cash basis, or tax basis. Adhering to a recognized basis of accounting helps ensure that financial statement are consistent from entity to entity and for the same entity from period to period. The accountant’s report indicates the level of assurance, the objective of the engagement, and the basis of accounting. Assisting management in presenting financial information in the form of financial statements. CPA does not obtain or provide any assurance. Generally appropriate for privately held companies. Least costly level of financial statement service. CPA provides user with comfort that the accountant is not aware of any material modifications that should be made for the statements to be in conformity with the applicable basis of accounting. The CPA performs procedures that will provide a reasonable basis for obtaining limited assurance that no material modifications that should be made for the statements to be in conformity with the applicable basis of accounting. Review often prepared for privately held companies to meet the requirements of outside parties such as banks, creditors, and potential purchasers. More costly than a compilation, but less costly than an audit. 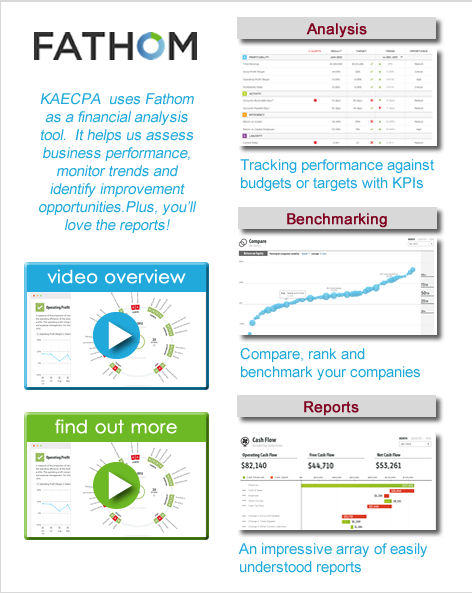 In addition, KAECPA has several software options that greatly enhance analysis and reporting. 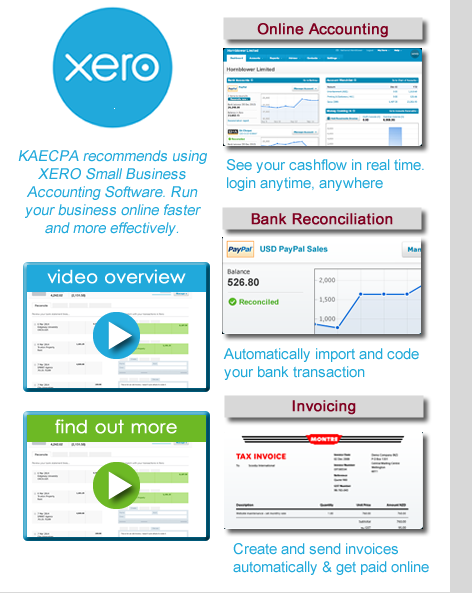 Please take a look at the summary of two of those packages - Fathom and Xero, below or go to the detail page for Fathomand Xero to learn more.